I hope the blog readers can forgive me if I engage in a bit of mold-making “inside baseball” for a moment. This is all a bit off in the weeds, even for those of us who make plaster molds. But after speaking to Joan Berkwitz recently, I discovered the reason behind a problem that has consistently plagued me. I have high hopes that now that I know why this happens, I can figure out a solution to stop it. Let me explain the problem. 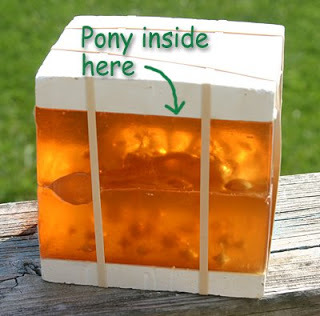 These are pictures of the two mold pieces that form Imp’s raised foreleg. The piece to the left in the small inset (gusset) piece, and the piece to the right is part of the large side piece. The pictures aren’t as clear as I might like (I’m pushing the outer limits of the close-up function of my camera here), but if you look closely you can see that the design area on the left hand piece looks dirty. 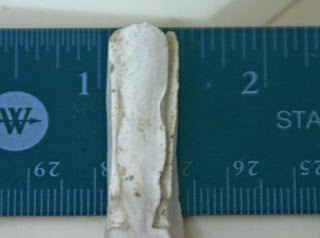 There are small bits of clay still stuck in some of the crevises of the leg. The piece on the right is discolored from a very recent pour, but there isn’t any actual clay left behind. The leg separated cleanly from the mold, which is what it should do. 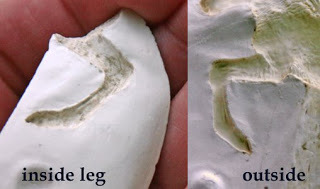 I’ve had the same problem with the inside leg pieces of the Al-Hadiye mold. In fact, the problem has been worse than the one with Imp. Obviously this kind of thing makes for a lot more cleanup work on the ‘stuck side’ of the leg, which is the last thing you want with a really thin leg. But the real problem is that because the clay will not release properly, it tends to pin the leg into the mold. That’s why Al-Hadiye is such a high-loss mold. Those front legs almost always get pinned, and then break as the mold is disassembled. What I found puzzling was that the first pour in both molds came out reasonably well. With Al-Hadiye, the loss rate quickly rose after that. With Imp, the problem was less severe but there was an increase in problems with that leg as the mold was used. This didn’t make sense to me, since usually castings separate from the mold more easily with time, as little rough spots get worn with use. That was the question I posed to my mentor, Joan. Why would I be experiencing the opposite problem? Joan explained that inner pieces like these gussets have problems because they don’t have enough plaster area to absorb the water from the slip. 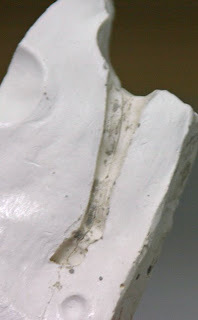 If the mold cannot pull enough moisture from an area of the casting, it doesn’t dry enough to release – or at least it won’t until the other parts of the casting are so dry that they break during the demold. These pictures of the Imp front gusset (top) and the Al-Hadiye middle gusset (bottom) show just how little plaster there is to absorb the water. And with Al-Hadiye, the situation is worse because he has two legs side-by-side, both needing to lose their moisture. No wonder he is so problematic! But when I mentioned that the legs were leaving a film of clay behind on these parts, Joan said that was more typical of getting a bit of sealant on the design area. We have to use sealant on these pieces to get the plaster to split apart after each mold piece is made. That’s why the size of the plaster inside is such a problem. The other surrounding plaster pieces cannot take that excess moisture because there is a barrier – the one painted on the inner pieces to allow them to separate later. The only plaster available to draw the water out is what is on that one sealed piece. So I puzzled and puzzled over this, until I had an epiphany. Joan was right. I did get sealant on the inner design. But not the way one might imagine. I wasn’t accidentally painting it into the design. It was seeping into the design from behind. We use mold soap to seal the pieces, and that soap is dissolved in water. The first few coats soak into the mold piece, and eventually build up a water-tight barrier. With less than 1/4″ of plaster, no doubt I was probably soaking that sealant through the back of the design. And even if I didn’t reach the design this way, I was still sealing up some ability of that plaster to absorb. And I didn’t have any plaster to spare! So this is now the problem I need to solve. If I can’t find a way around this, small-scale horses with side-by-side legs (like Al-Hadiye) are not feasible (perhaps in some cases not even possible) to cast. And all but the most simple of pieces will have a high loss rate. 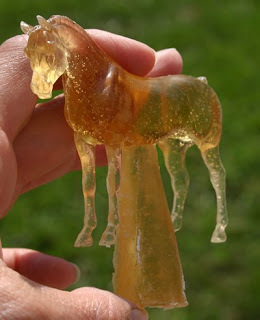 Of course, imagining how cool certain horses would look in ceramic is a serious motivator. And I have some ideas already. My first plan of attack is to see if there is some way to seal just the surface of these pieces, without anything soaking into the plaster. I just wish – for the hundredth time since taking up ceramics – that I had a stronger background in chemistry. As I have been pondering the molds for the Taboo family, I have come to the realization that I am going to have to confront a technical problem that I have been avoiding. All molds have problems. Whatever solution you come up with, there is always something that could be done better, if you had the job to do over. In the case of my last mold, the problems centered around stabilizing Al-Hadiye’s very slender legs. It’s a problem I expect to encounter again with the new guys, so I’m looking at the issue once more. This is the master mold for Al-Hadiye. It is composed of two plaster supports (in white, on the top and bottom), rubber versions of each mold piece, and a rubber version of the original. 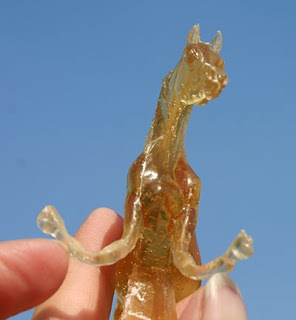 If you look closely you can just see the outline of Al-Hadiye’s neck and barrel inside the amber rubber. This rubber master is used to make the working plaster molds. One by one, the rubber mold pieces are removed and a plaster piece is poured in its place. In the end you have a plaster mold surrounding the rubber original. Then the mold is taken apart, the rubber horse is removed, and the mold is reassembled. As you can see, he’s got floppy legs. These caused all sorts of problems when I was making the mold for him. They wanted to shift around as each plaster piece was poured, making it hard to get a good, clean mold. I tried various ways of temporarily fixing the legs in place, but none seemed like the answer. 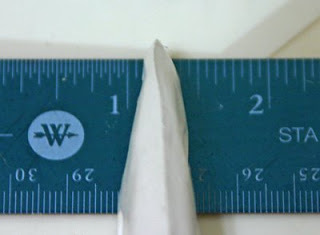 I considered moving up to a harder rubber product, and I may still try that, but I am not sure any rubber is going to be significantly stiffer in such a thin area. (And Imp’s legs are thinner still!) I’ve even considered taking the front legs off so the molds for them have fewer pieces. It’s tempting to do that now with Al, if only to get the chance to work on a true assemble-it-later mold with a familiar piece, before I give it a try with the new guys. What’s funny is that I still remember some years ago, when I first realized how these molds were made. I had been working for a year or so on simple medallion molds when I had that “aha!” moment where it was clear to me how multi-part molds were made. Knowing it seemed so monumental at the time. I’m glad that I didn’t have a clue then how little I really knew! Hello! If you are interested in realistic equine art, with a particular emphasis on horse color, you have found the right place. Here you can peek inside the pottery, and see the process behind the making limited edition ceramic horses. This is also home to an independent press devoted to publishing books about horse color, so those topics get discussed here as well. Please, browse around and enjoy the site. You can also reach me directly through the Contact page. 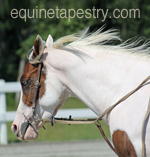 Want to learn more about horse color? Visit our companion site for a discussion of equine coat color genetics. Powered by WordPress. Designed using Canvas by WooThemes.